Joy Prom is February 24th at BCSC. The event will last from 6pm to 8pm. 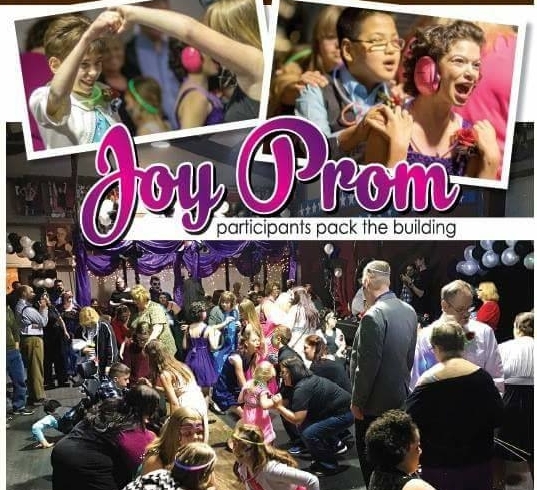 Joy Prom is a free full scale prom event held every year for people of any age with developmental and/or physical 'different-abilities.' In holding this event we will provide an enchanting evening for the guests while letting them know they are loved by Jesus and precious to Him. This evening is provided at no cost to our guests. Why will BCSC host Joy Prom? We believe that every person is made in the image of God and that each life should be valued and celebrated. Joy Prom is our way of spotlighting a community of people who are often overlooked in our society. What can I expect at Joy Prom? Expect to have fun! Joy Prom begins with a red carpet entrance where each guest’s name is announced and volunteers from our gym and community welcome them by clapping and cheering. From there, you can visit several different stations including nail painting, shoe-shine, photos and games. Music and dancing will start at 6PM, and that is also when refreshments will be served. Stations will stay open until 9PM. What food/drink will be served? This year we will offer finger foods along with drinks such as tea, lemonade, and water. Dinner will not be served at Joy Prom, so please plan accordingly. Is Joy Prom a drop-off event? No. We ask that a parent or caregiver be present with each guest or group of guests throughout the evening. This gives family and caregivers a unique chance to share in the joy! How can I support Joy Prom? Joy Prom would not be possible without the support of local businesses and volunteers. If you’d like to speak with someone about donating a product or service to Joy Prom, please contact Jeremy Augusta. There are many opportunities to volunteer your time on the night of event. Joy Prom was birthed out of Luke 14. Jesus tells his disciples a parable about inviting friends to a party or banquet. He discourages them from looking for recognition and actually says that,"When you give a luncheon or dinner, do not invite your friends, your brothers or relatives, or your rich neighbors; if you do, they may invite you back and so you will be repaid. But when you give a banquet, invite the poor, the crippled, the lame, the blind, and you will be blessed. Although they cannot repay you, you will be repaid at the resurrection of the righteous" (12-14). The Joy prom is fully self funded by the owners of the Barton County Strength Club and as the event grows, so do the expenses. PLease consider making a small donation to help us make this night even more magical for the participants. Please click below if you are able to help support this event. While donations are appreciated, they are absolutly not required to attend because we want everyone to have the magical evening they deserve. Please fill out the form below to let us know you will be attending.